Catholic Health Initiatives acquired St. Luke's Episcopal Health System in Houston (including flagship St. Luke's Hospital, above) in 2013. The aggressive push into Texas created challenges for the system. Hospital operator mergers have created big—sometimes behemoth—health systems that will provide the scale necessary to achieve operating efficiencies and compete for more cost-conscious consumers. But some of the biggest mergers in recent years have so far failed to deliver on that promise. Given that they took place during the friendlier operating environment of the Affordable Care Act's insurance expansion, their stumbles are renewing concern that mergers and acquisitions are not the best path for achieving those efficiency and competitiveness goals. The business case for bringing systems together can be undermined by previously unidentified problems, distracted management and clashing cultures, experts say. Those pitfalls can wind up being a drag on financial results and delay or diminish expected benefits. And where health systems financed their deals with debt, poor performance and higher leverage can amplify pressure on management teams. 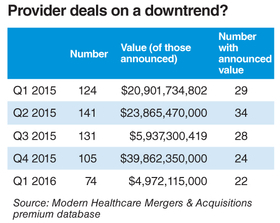 Yet that still hasn't deterred new deals, according to a Modern Healthcare analysis of first-quarter data on provider deals in its Mergers & Acquisitions database. 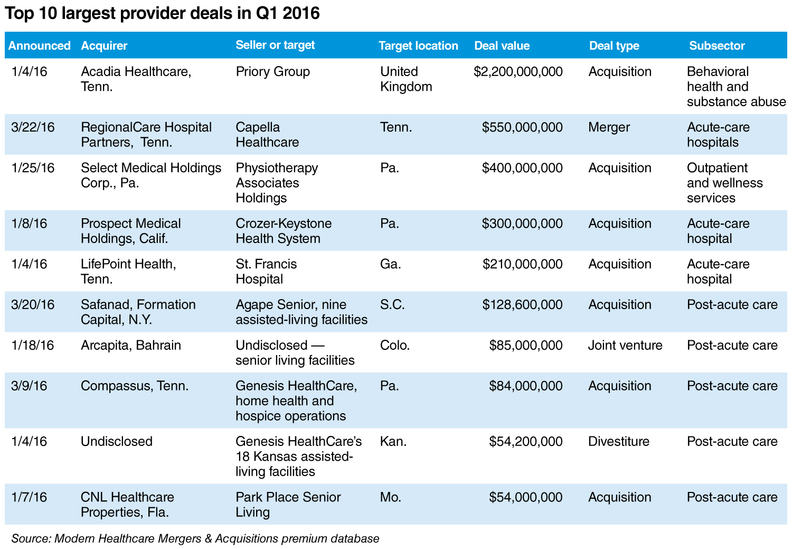 During the first three months of 2016, RegionalCare Hospital Partners of Brentwood, Tenn., and Capella Healthcare of Franklin, Tenn., announced a $550 million merger. 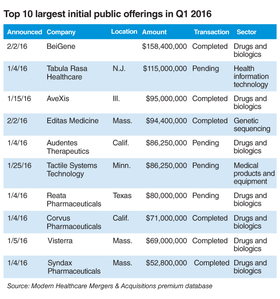 Two other major deals closed last quarter with executives bullish on their prospects. 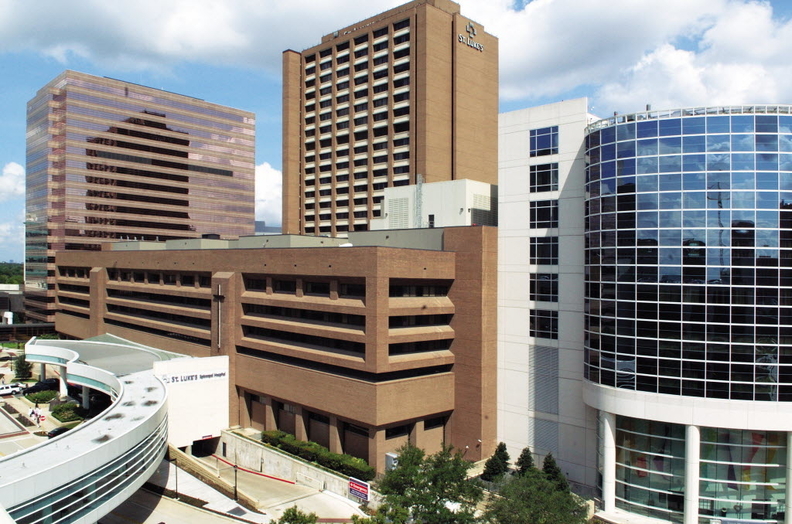 Los Angeles-based Prospect Medical Holdings acquired the Crozer-Keystone Health System in Springfield, Pa., for $300 million; and Brentwood-based LifePoint Health acquired St. Francis Hospital in Columbus, Ga., for $210 million. Executives who announced the RegionalCare and Capella deal said the combination would bring greater stability to the partners' operations, along with larger scale. The deal is expected to close during the first half of the year. Several of the major transactions that have closed in recent years underscore how tricky it can be to combine formerly independent organizations and manage rapid growth. Community Health Systems, based in Franklin, Tenn., has struggled to digest the company's 2014 acquisition of Health Management Associates, based in Naples, Fla. Earnings of $1.37 a share on $19.4 billion in revenue in 2015 are still below the $1.52 a share on $12.8 billion in revenue generated in 2013, the year before the merger. CHS gained 71 HMA hospitals in the deal but also inherited operations weakened by management turnover, government inquiries and investor unrest. HMA investors had voted to oust HMA's entire board in the months before the deal closed. Hospital system executives continue to pursue size and scale through mergers despite the evidence from some recent deals that problems undiscovered during due diligence—or from culture clashes—may make the marriage hard to consummate. That has added stress to CHS financials during a period of global market turmoil that has battered the company's stock. CHS spokeswoman Tomi Galen said the company could not comment during the quiet period ahead of a planned spinoff. HMA did not recruit doctors or invest in capital projects during the year before the acquisition, Cash told analysts. Management turnover added to the challenge, as did employee satisfaction below that of CHS' workforce. Competitors sought to capitalize on HMA's disarray. “It's hard to hit the ground running where people had really not focused on the day-to-day business,” Cash said. Recruitment and morale have both improved since the acquisition, he said. CHS continues to see potential benefits from the deal, and HMA hospitals have bolstered CHS markets in Mississippi, Oklahoma and Tennessee. “We think they're good assets,” he said. National health system Catholic Health Initiatives has seen financial stress from rapid growth as well. Now the system will seek to slash expenses as operating losses erode its cash reserves. Deals in Texas and elsewhere have doubled CHI's revenue in five years. “It's very difficult to double in size for any organization and maintain the efficiency and effectiveness,” Dean Swindle, the system's chief financial officer and president of enterprise business lines, said during a March conference call. “So that's an opportunity we have by now pausing, with growth slowing, that we can now go get some of the integration opportunities there,” Swindle said. He was not available for an interview, a spokesman said. The Englewood, Colo.-based system reported an operating loss for the three months that ended Dec. 31 of $125.9 million. By the end of last year, CHI could operate for 151 days using cash reserves, compared with 178 days of reserves six months earlier. Poor performance in Texas contributed to the system's losses. CHI entered Texas in 2013 with the $1.2 billion acquisition of St. Luke's Episcopal Health System in Houston. CHI added four more Texas hospitals the following year with a deal for Memorial Health System of East Texas. The energy sector's woes have hurt the Texas economy and CHI hospitals there, Swindle said. But the aggressive push into the state's market also created challenges “as we try to get our feet under us with some of the strategic relationships,” he said. “Integrating all the parts of Texas has taken some energy” both in terms of operations and relationships. Other deals in Nebraska, North Dakota and Washington added to CHI's recent growth. So did the system's expansion into health insurance, a strategy that has so far lost money and is under review. Now system executives plan to improve annual performance by $800 million by targeting expenses and strategies to increase revenue. Swindle said the system will cut jobs and examine ways to consolidate clinical leadership and management. The system did not immediately target those costs at acquired hospitals and will now do so, he said. Opportunities to reduce operating costs and gain economies of scale are an expected benefit from deals. But savings can be elusive without close attention to “easily overlooked” cultural differences between the combined companies, said Andrew Waldeck, a senior partner with Innosight, the management consulting firm co-founded by Harvard University professor Clayton Christensen. “There are difficult decisions that have to be made” about how organizations run, which processes to follow and where new organizations may decide to develop hybrids, Waldeck said. Transactions grow more complex when deals involve assets that will diversify operations or seek to position companies for changes to their business models. “I think there's always execution risk,” said Barry Ostrowsky, former CEO of Barnabas Health in West Orange, N.J., which merged in March with the Robert Wood Johnson Health System in New Brunswick, N.J. The new system created a regional giant in the state. Executives opted to overhaul management and divide leadership of the newly created system into smaller geographic divisions. “Execution is a matter of local concern,” Ostrowsky said. Local leadership needed a “digestible market” to manage within the larger system, which has roughly 5 million people in its service areas. Cultural differences can range from the diversity of governing board members' experience and skills to the degree of risk an organization is willing to take, said Richard Zall, partner at Proskauer and a healthcare attorney. Potential partners' due diligence should include more than strategic and financial profiles, but “organizational personality” as well. Deals with clashing cultures may struggle to succeed, he said. Planning before a merger can overcome many of these difficulties. At Dallas-based Baylor Health Care System and Scott & White Healthcare in Temple, Texas, executives named a chief integration officer ahead of the systems' 2013 merger and audited each organization's culture ahead of the deal. “What we found was that we were much more alike than we were different,” said LaVone Arthur, chief integration officer for Baylor Scott & White, Dallas. Following the merger, the system continued quarterly culture surveys for more than a year across all departments. Results helped the organization focus communication on employee questions and concerns. Arthur also reported results at each board meeting and scores were incorporated into incentive compensation. The system moved quickly to identify leaders in the new organization and required a weekly meeting of an operating council, which was created to oversee integration. The weekly meeting fostered relationships among executives, and assured managers they would receive swift answers to questions about integration. “That was a way to act immediately as a system,” Arthur said. The system has so far achieved savings more quickly than projected, said Fred Savelsbergh, chief financial officer for Baylor Scott & White. As of last December, the system had reduced spending by $277 million, or 40% of the targeted $577 million the deal is expected to save over five years.